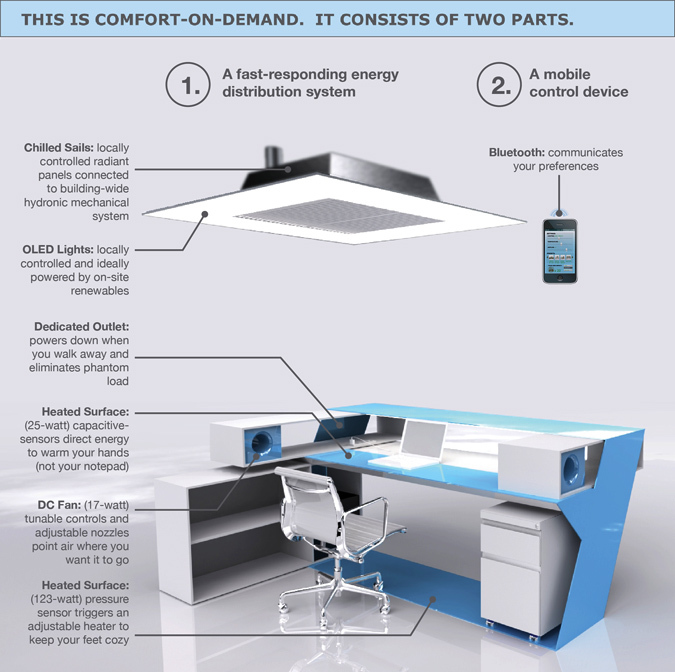 What If Your Hot/Cold Preferences Could Follow You Around The Office? An award-winning proposal would allow workers in a government office building to bend the HVAC system to their individual preferences. With a home office, I never have to worry if the temperature, lighting, or power situation isn’t to my liking: I just set it up exactly how I want it. But if you work in an old federal office building run by the U.S. General Services Administration, you kind of just have to put up with what you get. Designers Beau Trincia, and Nash Hurley and Taylor Keep of VITAL Environments, decided that just wasn’t right — especially if, by allowing workers to customize their own personal climate control at work, they could help the entire building reduce its energy consumption. Their “Comfort-On-Demand” proposal, which was a runner-up in Metropolis magazine’s Next Generation Design competition, would give every worker in the GSA building a smartphone app that they could use to dial in their personal preferences to the building’s lighting, heating, and cooling systems. Their workspaces would then follow the instructions: pressure-sensitive pads under your desk and on its surface would warm you up on chilly days; personal fans with adjustable nozzles, as well as radiant “chilled sails” overhead, would cool you off after biking to work.